MIKE WHITE was a British comic artist known principally for his work on various IPC/Fleetway and DC Thomson titles. Mike White began submitting work to comics publishers in the early 1960s, and his earliest work was for Micron’s romance titles in 1963-64. He moved to London and His first regular strip was drawing “Jackaroo Joe”, (about the adventures of a ‘swagman’ in the Australian outback) for Valiant in 1965, written by Angus Allan, for Valiant in 1965-66 and ghosting for Mike Western on “School for Spacemen” for Champion. 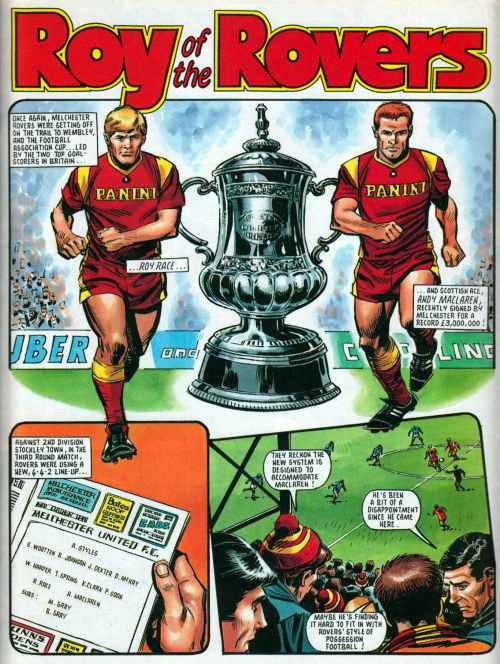 Other strips he drew included “The Lords of Lilliput Island”, “Cannonball Craig” for Score ‘n’ Roar, “The Team Terry Kept in a Box” (1973-4, written by Frank S. Pepper) for Lion, “Whiz-Along Wheeler” and “The Test Match Terrors”. For Action in 1976 he drew “The Running Man”, “Hell’s Highway”, “Kids Rule OK!” The notorious Kids Rule OK strip (pictured) which led to the suspension of Action due to its violent content and “Hellman of Hammer Force”. He drew a number of “Future Shocks” and “Time Twisters”, including “The Reversible Man” and several Abelard Snazz stories written by Alan Moore, as well as “Distaster 1990” (1979) and “The Mean Arena” (1981-82), written by Tom Tully, for 2000 AD. Again with Tully, he worked on “Sintek” (1982-84) for Tiger, and drew “Wagner’s Walk” (1979) for Tornado, “Starhawk” (1979-80) for The Crunch, “Iron Barr” (1983-84) for Spike, “Deep Sea Danny’s Iron Fish” and “Raoul the Warrior” for Buddy, and “We Are United” for Champ. After that he more or less specialised in football strips, drawing “Dexter’s Dozen” (1985-86), “Cheat” (1992-93) and “Dream Keeper” (1993) for Roy of the Rovers, as well as drawing the lead strip from 1986 to 1992. As boys’ adventure comics declined, he moved into illustration, notably a series of historical educational books, but still contributed to Sonic the Comic and DC Thomson’s Football Picture Story Monthly and Commando digests, his last story for the latter appearing in March 2011. In his last years his arthritis was so bad he had to hold his drawing hand in his other hand. Mike White passed away in February 2012 after a long illness.